This is a sort of follow-up post from Thursday’s TEP Conference here in Western Massachusetts. I wrote the other day about Alan November, and the second keynote was by Jim Moulton, who was one of the planners behind Maine’s 1-1 Laptop Initiative, is a former teacher, and is now is an educational consultant for Apple. Moulton focused his talk around Maine’s laptop program, and he argued that putting devices in the hands of all middle school students has changed the ecology of the educational system in his state. This doesn’t mean that every element of teaching and learning has been transformed, but Moulton said that putting the tools of creativity in the hands of students, and their teachers, have established collaboration, audience and creativity has key components to many classrooms and libraries in the Maine school system. While some worried that technology might replace teachers (or the need for good teachers), Moulton argued that it is, in fact, quite the opposite. The technology has opened up even more doors of opportunity for teachers to work with engaged students. “The (technology) device drives a profound need for human interaction with kids. It’s a return to a Socratic method of teaching,” Moulton explained, and although he did not refer to the Digital Native/Digital Immigrant dichotomy, he is right in debunking the perception that young people “get” technology and know how to use it wisely. The heart of Moulton’s talk was not about the devices, although he is now an Apple consultant in a state that has bought all Apple products (through a bidding process), but about the networks of connections of people that spring up around the technology, and how powerful those connections can be for teachers and students. He cited examples that were born from the 1-1 initiative, such as regional technology integrators’ meetings to share best practices, teacher groups coming together to explore and plan curriculum, connections from schools to many other organizations (around science and history), partnerships with universities to support the technology learning and the students themselves. An annual conference at the end of the year brings together more than 1,000 students to share their work around technology with each other. “We have the technology, but that’s not enough,” Moulton said. “It is about the social networks that spring up and the way we choose to leverage the unbelievable resources in our schools” for student learning and achievement. In other words, it is not about the device. It is about the learning. He cited a recent ad campaign by Apple that seems to drive this home. 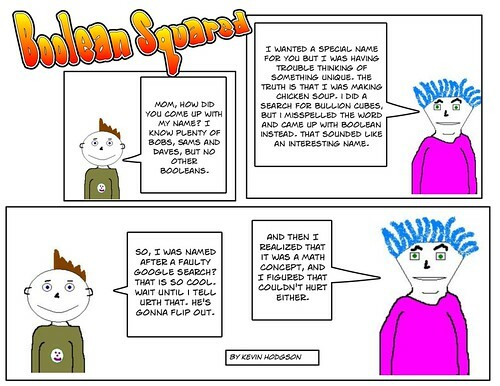 (Remember, he is an Apple consultant now). The advertisement’s focus is that when technology becomes invisible, incredible thing are possible. At the risk of sounding like I am endorsing Apple, I wanted to share the ad Moulton referred to. Sure, it is selling the iPad, but the message is interesting. Three smart Phd student presenters from Purdue University — Alex Layne, Jessica Kaiser, and Jessica Clements — talked about the idea of gaming from various angles. I imagine I was one of the only elementary teachers in the crowd, but I found it intriguing how these three are situating gaming from various stances. Layden (“Gaming the System in a System of Games”) established the social nature of gaming and made the metaphor of the academic classroom as a game system in and of itself. She also railed against the concept of “gamification,” in which traditional learning activities are put into a new box with the idea of a “game” on it. Layden rightly noted that the idea of gamification comes from the marketing arm of the business world. Kaiser (“There’s Nothing Casual About This Gaming”) jumped into the divide that exists in the gaming world around hard-core games (those that fully immerse you in their worlds and which require hours of playing time to reach the end of the quest) and casual games (which take a few minutes to play but are often now very social in nature.) Kaiser noted that while casual games get scoffed at by some hard-core gaming fans, the majority of players of these games are women. Her talk turned on how some populations — women, minorities, etc. — can feel left out of the gaming worlds that are not designed for their interests. Clements (“A Tale of Two Gamers”) offered up a more personal perspective, turning an inquiry lens on her own gaming experiences with her husband. She conducted a indepth research project into both of their histories around gaming and their views on gaming (which stemmed from them playing Mario Bros. on the Wii). Her idea was to look at how we view writing as a social practice and see if her own inquiry matched up. What she concluded was quite opposite. While she is a strong academic writer, her own gaming preferences are for more solitary, competitive-driven experiences. Her husband, on the other hand, was not a strong academic writer (she says) but grew up as a very social gamer, and continues to be so today. Clements adds that expectations of writers value the solitary person over the social group in most classrooms, but she wonders if gaming ideas might allow some struggling students to have another way into literacy practice. It was all very interesting, and a lot to digest, and (as you might expect) very academic. It would have been nice to have seen or heard about more classroom experiences where gaming is at the center of learning, and what that has meant for the students. I guess that is another road of inquiry that I need to take. Meanwhile, as I was getting ready to write this, I saw this video link about gaming and learning. Game scholar Constance Steinkuehler reflects on how gaming can matter, particularly teenage boys and literacy. She saw an afterschool program as a “third bridge” between school and games for the boys in her program. Constance Steinkuehler from New Learning Institute on Vimeo. Yesterday, at the first annual TEP (Technology in Education Partnership) Conference (tagline: A Conference for the West of Us, as conferences usually take place in the east of the state near Boston), Alan November was the keynote speaker. At times funny, sarcastic, optimistic and downtrodden by the state of education, November launched into an energetic discussion that certainly did its job: it got the crowd of technology leaders, school administrators and teachers talking and thinking. He began with the critical question: who own the learning in our school? November argued that teachers do more of the work than students, and that the model has barely changed in the generations since public education became a backbone of our society. New technology has not revolutionized teaching practice, he said. “We’ve bolted technology on top of a culture of learning that we have never questioned,” November said, and then urged us in the crowd to turn the tables on that notion. He then went into great detail about the concept of the Flipped Classroom, where teachers record lectures as pre-class homework and the use the class time for hands-on projects and learning. He shared some video from a Harvard professor doing research on the Flipped Classroom, but I could not help thinking: show me the Community College or the public high school, not just motivated Harvard kids. November also said that the model of students working on isolated assignments, with teacher as sole audience, is out of sync with the learning styles of students. Instead, learning should be social, it should engage the lines of inquiry, and projects should allow students to “leave a legacy” for others behind them. The model now is that “you work all year and then, we throw out everything you did,” he mused. Technology allows the building of legacies to happen, he said, and gave the example of a fanfiction site that has hundreds of thousands of young people writing stories. They write, get peer feedback, revise and publish to the world, but November said he was confronted by a teacher of one of these young writers at a recent conference who did not the value of fanfiction. In the end, November told us, it is not the tool or even the technology itself that we need to pay attention to. “Don’t think technology. Think kids,” he said, and expressed exasperation that all the talk of redesigning schools seems to lose track of this focus. “Forget redesigning schools. We need to realize that technology is not the revolution. It’s the internet” and the global information structure that allows for collaboration and project-based ideas. At one point, he grilled the crowd on using Google as a search engine, asking us how to do a simple narrow query around schools in England that teach about the American Revolution. So few of us knew how to search for extensions for countries that he just shook his head at our lack of knowledge. “And you are teaching our children,” he muttered. We’ve still got a ways to go. This morning, I am co-presenting a session at a regional technology conference on the topic of Technology Across the Curriculum. It might as well be Writing Across the Curriculum, with technology. 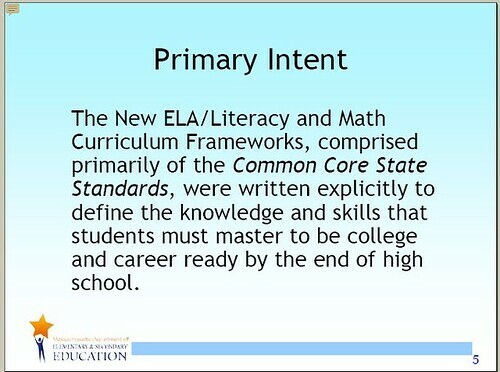 But we will be covering assessment, too, and the changing curriculum landscape with Common Core. We are linking this presentation to some of our work at the National Writing Project’s Digital Is site. The three of us are part of the Western Massachusetts Writing Project Technology Team. Our state’s Department of Elementary and Secondary Education released information this week on its schedule to merge the Common Core curriculum with our own Massachusetts Curriculum Frameworks. 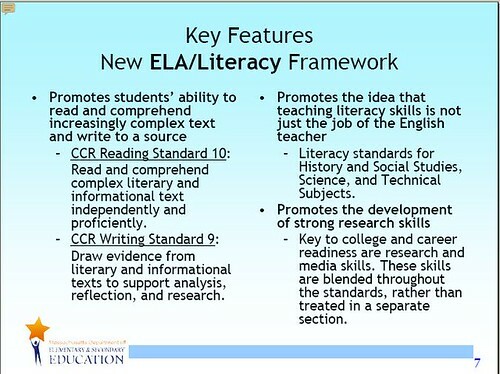 The focus is on college-ready literacy and mathematics, with emphasis on informational/persuasive writing and content-area reading. Narrative writing takes a back seat to expository writing, I think. The actual frameworks are not yet out, but will be soon. 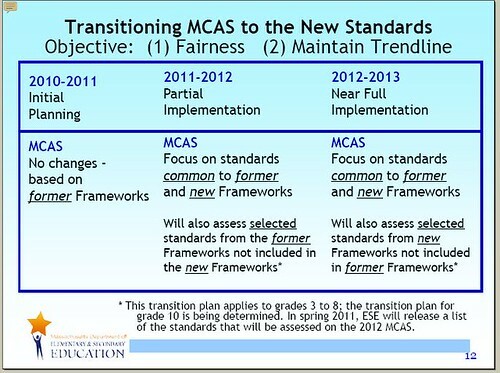 Here are a couple of slides from the state’s report, which shows that we are in a transition year next year and then quickly, we will be right into a Common Core-aligned curriculum. Many of us are wondering when our standardized test will reflect the shift, and it looks like a partial implementation of the new test will be next year, and then a full implementation the following year. As it turns out, I will be talking a bit about the Common Core shift on Thursday, when I co-present a session entitled Technology Across the Curriculum with two Western Massachusetts Writing Project colleagues (Tom and Tina) at a new conference entitled Technology in Education Partnership (TEP), where Alan November is the keynote speaker. (And can I say that this conference seems very vendor-driven, so I am not sure how it will be.) We’re happy to have an event like this in our part of the state, however. I was able to grab the cart of Macs yesterday and give students some time to keep working on their digital stories, which are an extension of our narrative paragraph writing around a memory object. Luckily, the Internet worked fine for gathering music (the connections were a little slow but they worked). I think we still need one more day for the last group who spent a little too much time yesterday either chatting or listening to music (and not choosing a piece), but I’ll get that done when I can. On Friday, I will be in Atlanta for the annual Conference on College Composition and Communication (4cs) and I am presenting an early morning session with some fellow National Writing Project/Western Massachusetts Writing Project colleagues– Anne Herrington, our site director and a professor at the University of Massachusetts; Donna LeCourt, a member of our WMWP technology team and a professor at the University of Mass, and Elyse Eidman-Aadahl, a co-director of the National Writing Project. Our talk is entitled “Broadening our Community to Reaffirm Connections with K-12 Educators” and our goal is to explore the connections between the university and the classroom, with the National Writing Project as a model for how those connections are made and nurtured. My own part of this talk is entitled “An NWP Site’s Teacher and Student Collaborations on Digital Projects,” and I have been thinking of what I can talk about in my 15 minutes or so. There are so many connections that have been made with the National Writing Project and so many ways in which my students have benefited from those connections. So, here is an outline of my path of talking (still subject to change). First year teacher — WMWP opened up my eyes to the value of what we now call PLC — that of teachers coming together to share and support and nurture each other. Led to Tech Friends (social networking space for NWP teachers across the country); the Collaborative ABC Movie Project; and the iAnthology (inspired by the eAnthology) which is now home to almost 450 NWP teachers for writing. The Digital Is site is the latest iteration of collaborating for shared knowledge, with a focus on digital learning and how technology is shifting the way we teach and the way we learn. Summer Writing Projects (through WMWP partnership with a local vocational high school) — Webcomics, Stopmotion Movies, Digital Storytelling, and Gaming. The connections as WMWP/NWP teacher allowed me to tap into knowledge and expertise, explore it and then bring it into the classroom.